Pizza is big business and an American favorite (and one of my kids’ favorites too!). Experts estimate that half of us eat pizza at least once a week and that in our lifetime, we will eat an average of 6,000 slices! This makes pizza a $37 billion a year industry and a favorite food for many people around the world. Growing up, I have fond memories of pizza night every few weeks, (though due to budget restrictions, we often made it at home). When my husband bought a book about the history of pizza home from a book sale for our kids, I decided to re-vamp this tradition with our own family. I wasn’t going to be making or buying pizza that only consisted of refined flour, processed cheese and vegetable oils. Not only was it unhealthy, but my kids would be hungry again within the hour. 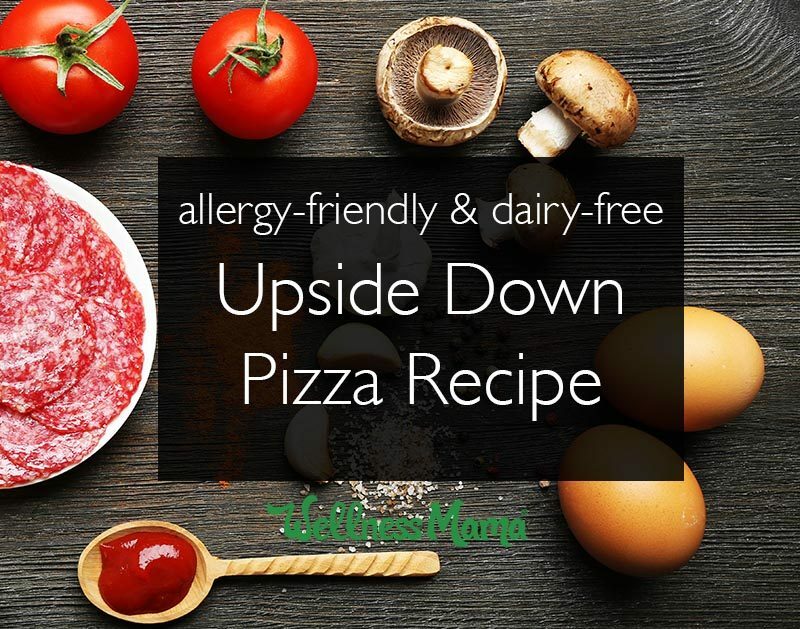 Considering that kids ages 3-11 prefer pizza to any other food group when polled and that 36% of adults consider pizza a perfect breakfast food (especially my husband), I set out to make a high-protein, allergy-friendly pizza. For us, this meant a gluten-free, dairy-free (and egg optional) pizza recipe. 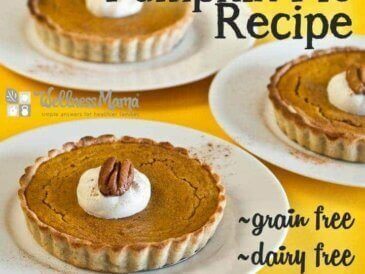 I also wanted one that was higher in protein and vegetables than the average pie. I also wanted one that we could make from home and that would allow me to keep the tradition of family pizza night alive. My two year old (at the time) named it because when she saw us making it, she declared it “upside down” because the meat was on the bottom. If you like to DIY, you can make your own Italian Seasoning and homemade Pasta sauce for this recipe. Preheat the oven to 450 degrees F. Grease a lipped cookie sheet with olive oil and set aside. Thinly slice the onion, mushrooms and olives. 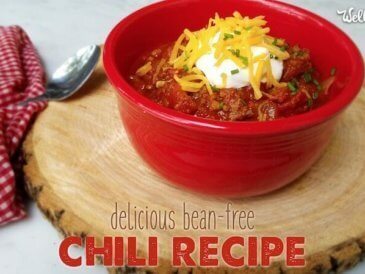 Place in a medium bowl with the bell pepper and set aside. Place the beef, eggs, salt, pepper and Italian seasoning in another medium bowl and mix well by hand until incorporated. Spread the beef mixture onto the prepared cookies sheet. Roll or press the meat onto the cookie sheet until flat and spread to the edges. Place in the oven and cook for 10 minutes or until browned and most of the moisture has cooked off. It will reduce quite a bit, which is fine, just make sure it is browned around the edges and not pink in the middle. Remove from the oven and pour off any grease from the meat. Spread the pizza sauce over the "crust," then top with sausage/ham/pepperoni and onion, bell pepper, mushrooms and olives. Return the cookie sheet to the oven and watch closely. It will only need to be under the broiler for about 6-8 minutes. Alternatively, you can just leave the oven at 450 for about 10 minutes if you prefer not to use the broiler. Cook until toppings are slightly browned. Remove from oven. Let cool for three minutes, slice and serve. This is really good cold as leftovers for lunches. 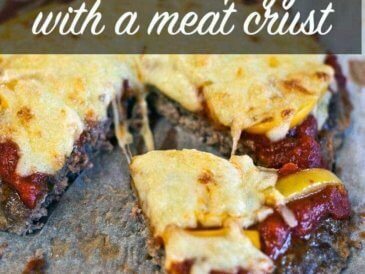 It has a similar texture to pizza with a lot more protein! To make personal pizzas, roll the meat into small (4-5 inch) circles instead of one big crust. 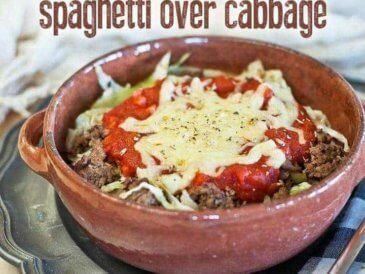 If you tolerate dairy, of course, you can add cheese of choice to this recipe. What foods does your family like to make together? How have you adapted them?